New York City - LATEST TRANSIT NEWS! With the M60 bus, you can travel to all terminals at LaGuardia from the West Side, the East Side or Astoria (Queens). The M60 runs between 106 St and Broadway in Manhattan and LaGuardia Airport from approximately 5 am to 1 am, seven days a week. The M60 serves all airport terminals. Connections can be made with all north-south Manhattan subway lines or with the N and Q trains at the Astoria Blvd station. If you pay your fare with MetroCard, you can transfer free between the subway and the M60 bus. The M60 also makes convenient connections with MTA Metro-North Railroad at the 125 St station. Travel time between Broadway and 116 St and the Delta Terminal is approximately 40 minutes. The Q48 provides local bus service between Flushing and all terminals at LaGuardia Airport. It loops through LaGuardia Airport and makes a stop at Mets-Willets Point. Free transfers between the Q48 any bus or the subway are available if you pay your fare with MetroCard. The Q48 operates from 4:30 AM to 1:00 AM. Travel time from the Main St 7 station to LaGuardia Airport is approximately 30 minutes. CLICK here for Q48 schedule. Q33 and Q47 from Jackson Heights provides local bus service between Jackson Heights and LaGuardia Airport. Check the Current Service Status of all MTA services and plan your trip with Plan&Ride. If you require assistance, please call us at (718) 330-1234, 6 AM to 10 PM, 7 days a week. The A stops at Howard Beach every 5 to 10 minutes during rush hours and every 15 to 20 minutes evenings and weekends. 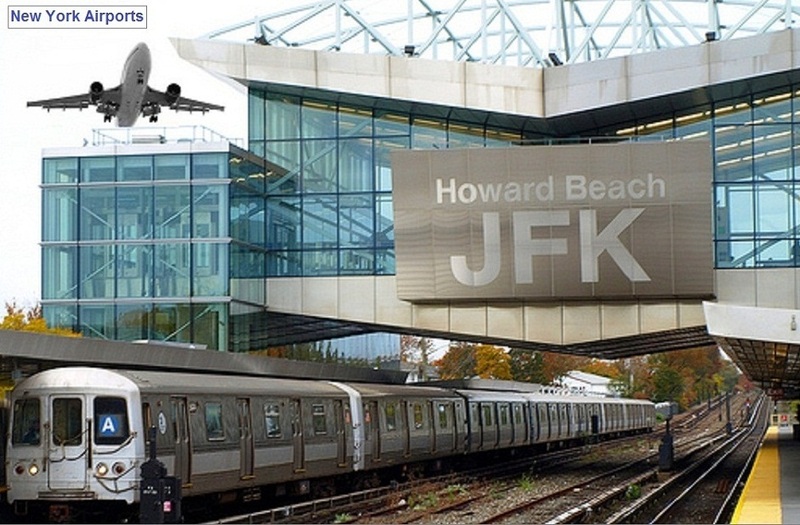 AirTrain stops at Howard Beach every 4 to10 minutes. Most subway lines connect to the A . Just be sure you take the A marked "Far Rockaway" or "Rockaway Park", NOT " Lefferts Boulevard". Its about a 12-minute ride from Howard Beach station to the airport. The AirTrain fare is $5 and is in addition to the subway fare. You can pay the AirTrain fare with a Pay-Per-Ride MetroCard. E, J, Z trains all stop at the Sutphin Boulevard station in Jamaica where you connect to the AirTrain Jamaica station. E, J, Z trains run every 5 to 10 minutes during rush hours and 8 to 12 minutes evenings and weekends. AirTrain travels to the airport from Jamaica every 4 to 10 minutes. The AirTrain ride to the airport takes about 12 minutes. The AirTrain fare is $5 and is in addition to the subway fare. You can pay the AirTrain fare with a Pay-Per-Ride MetroCard. You can connect to AirTrain at the LIRR Jamaica station. Tweets about "NY_NJairports OR nyairportsvc OR PATHtweets"
Liquids: Keep in mind that liquids are allowed in carry-on luggage only in accordance with the TSA's 3-1-1 format. Please review this policy. Prohibited Items: Click here for a list of prohibited items. Batteries: Click here for more information if you're traveling with battery-powered equipment. Food/Gifts: Click here for more information. There are some exceptions to these policies for customers with disabilities and medical conditions. Visa/Passport Information: Visit the Department of Homeland Security Web sitehere for more information. Passengers with questions may contact the Transportation Security Administration Coordination Center at (866) 289-9673. Click here to visit the TSA Web site. U.S. Customs and Border Protection offers expedited travel for pre-approved, low risk travelers who qualify. For information on CBP's Global Entry Program, click here. For more information visit: Transportation Security Agency (TSA), Federal Aviation Administration (FAA) and Customs and Border Protection (CBP).